You’ll recall that last year we met Bill Sullivan & his wife, Elizabeth, who, whilst not one of the “MenInTheShed”, gave me (via Morris Sheppard’s son, Jim) lots of information of the time when he was “on the run” with Morris, allowing us to re-find the places they’d been, I was proud to be able to offer to re-acquaint him with some of the places they’d visited. Unfortunately, last year, Bill wasn’t well enough for the tour, but with careful planning, this year, we had a whole day ahead of us. We initally headed to just west of Sainte Mere Eglise to the famous crossing of the River Merderet by the farm of La Fiere where the 82nd Airborne Division held off & then pushed back the Germans to hold this key objective. There is now a number of memorials on what is now a quiet river bank. This website tells the tale. Did you hear the one about the Scottish “Tankie”, an American “Para” and a Jeep bonnet? 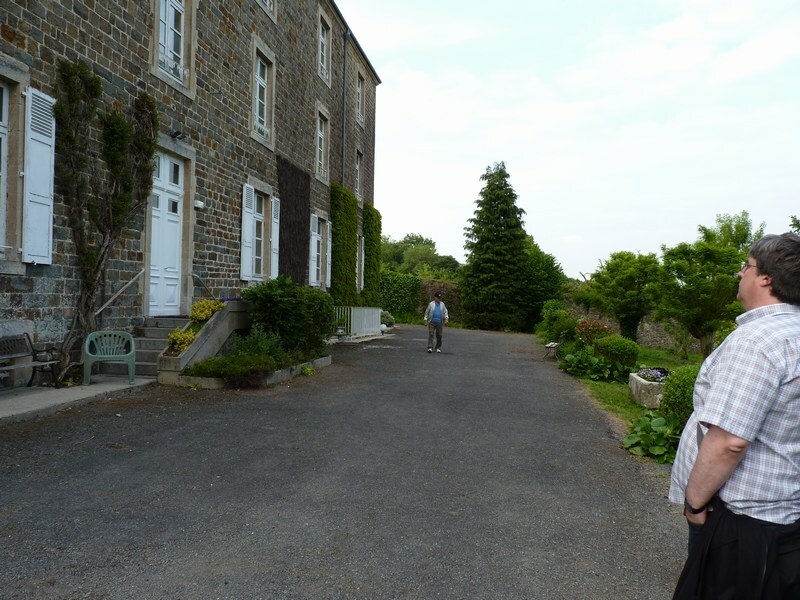 Yes, it sounds like the start to a long rambling joke, but it’s not… Peter & Eain Findlay had followed us to La Fiere & then into the grounds of Le Manoir which overlooks the famous bridge & is now a B&B where Bill, Elizabeth & her sister’s family was staying. We also met Mike (whom we’d met on Saturday) as he is collecting veterans’ signatures on a restored jeep bonnet & had asked me to check with Elizabeth that Bill would be willing to do this, which he was. So, there was a brief review of who was where during the Normandy fighting, a signing of the bonnet & lots of photos & then Peter presented Bill with a copy of Ian Daglish’s book on Operation BLUECOAT in the “Over the Battlefield” series which details the first time that Peter’s unit – 3rd battalion, Scots Guards – saw action when they took & held Hill 226, ‘though this did see them incurring many casualties. Then, as we’d decided to take full advantage of the fact that my Discovery has 7 seats & all tour together, we needed to empty the boot & back seat of the car… it still amazes me how much crap two blokes can carry around with them! fact that when Bill Sullivan, Morris Sheppard, Al Krietsch & Marty Knafl were either on the run, or caught & being transported by the Germans, they didn’t follow a nice circular route, we had to visit each of the places in a different order to what they were in 1944. Our first stop was at the old flour mill at La Cour d’Aisy between Varenguebec and Doville & a warm welcome from M. & Mme Lenot who now own the property. been culverted since then. We then shared some of M & Mme Lenot’s home made Normndy Champagne and tell Bill’s story to the local newspaperman that had been invited. Unfortunately, the tight timing of our itinerary meant that we couldn’t stay too long, ‘though not before lots more photographs were taken! What was great to experience was the fact that our party’s French wasn’t particularly good & M & Mme Lenot & the reporter didn’t speak much English… but we still managed to get the story over & the hospitality that we received transcended language. 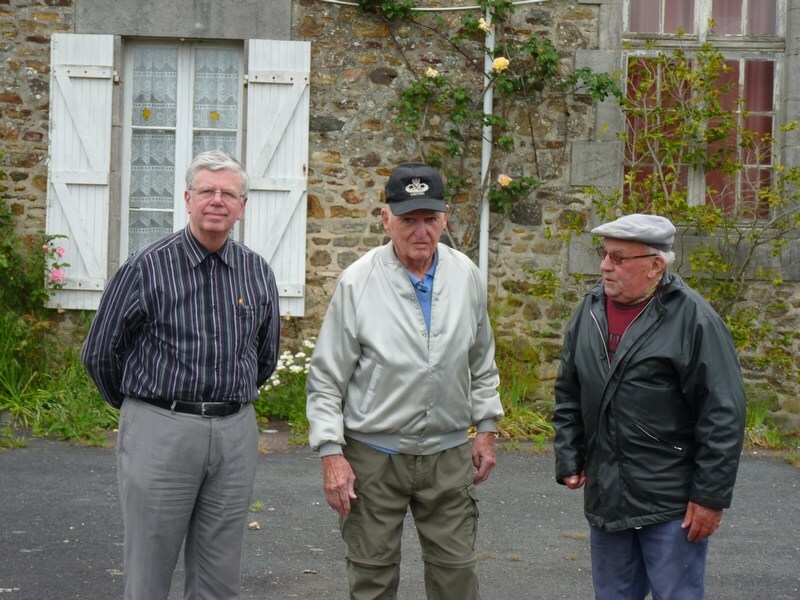 Our next stop was the town of Creances, where the 4 guys (Sullivan, Sheppard, Krietsch & Knafl) had been hidden in a couple of barns & you may recall, Bill had revisited & left a statuette of a paratrooper. However, we took a small detour to pick up another village, ‘though Bill couldn’t recall any of the buildings. Once in Creances, we had a bite to eat & then on to the Mairie where the deputy mayor – M. Michel Athanase – made us feel welcome as the Mayor, M Lemoigne, was out of the country. where Bill & the gang hid out for 8 days. We were joined here by M. & Mme Leconte & M. Gautier and their families whom we’d met on our previous visit, by local reporters and a film crew! I had been concerned about how easily Bill would have been able to walk to the barn in the woods as when Glyn & I visited the grass was very high. However, prior to our visit, a wide path had been mown right up to the barn, making access very easy. The report of the visit even made it into the local paper & local newsletter. 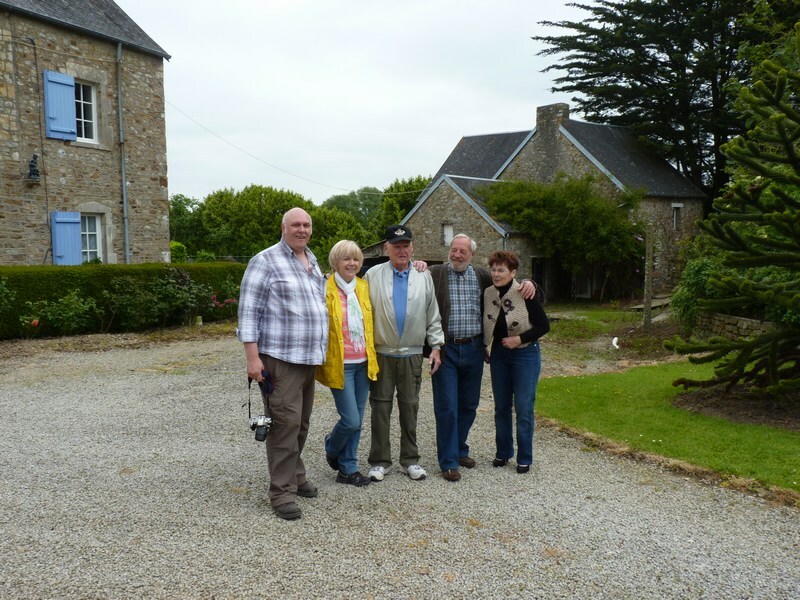 Having had Bill explain what had happened back in 1944, we all joined in some more Normandy Champagne before heading back to the town hall (or Mairie). Once there, the Deputy Mayor explained about the exhibition that had been set out in the entrance foyer of the Mairie focusing on Creances during the Second World War prepared by M. Benoit Beauquesne, and then he presented to Bill a map that had been drawn up by M. Regis Giard. 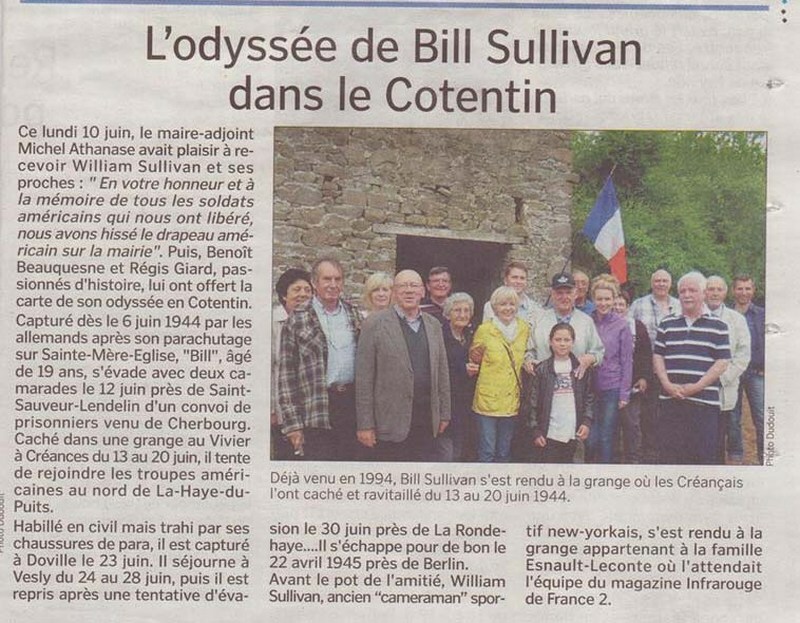 Fortunately, my poor French-English translating wasn’t required as we were ably assisted by M. Regis Giard and also by Mme Valerie Cardin (nee Gautier) who both Bill Sullivan and Morris Sheppard wrote to after the war. 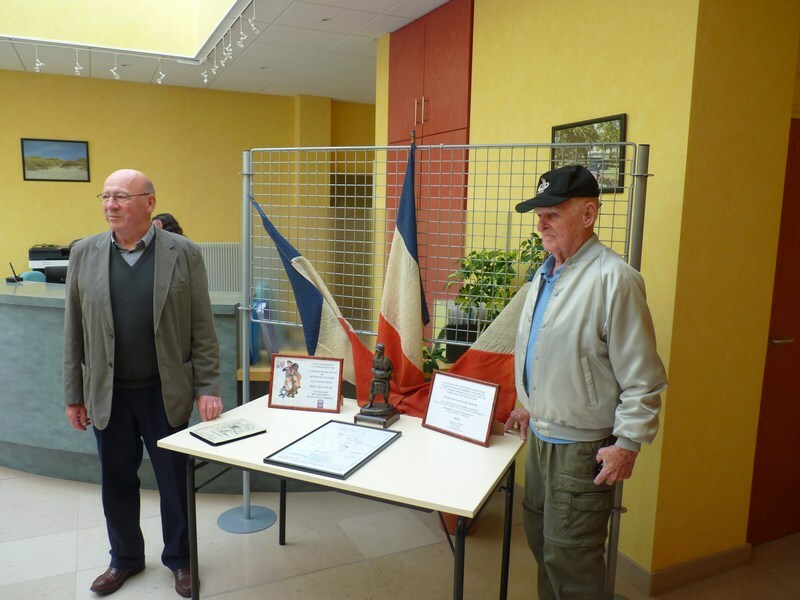 Since writing the original summary of this part of the visit, I have received a lovely email from M. Francois Leconte who told me that also present was his mother, Mme Marie Leconte Esnault (91 years young!) whose father (and Francois’s grandfather), Monsieur Auguste Esnault was one of the people who helped hide Bill Sullivan & the others in the “Owl Shack” back in 1944. She had heard lots about Bill from her father and so was delighted to meet him on the day. In many ways, this sums up perfectly what I’ve tried to do in telling this story – add small jigsaw pieces of people’s past lives into the present. 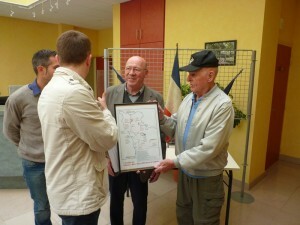 La Ronde Haye was the last time that Bill Sullivan & Morris Sheppard would see each other during the war. They were taken to the village with around 40 others & held in the schoolhouse. However, the lax way in which the Germans guarded them allowed Sullivan & Krietsch to escape & also Sheppard & someone else… unfortunately, they were all recaptured, but at different times. When we arrived, Glyn took our party to the building that we had guessed might be the schoolhouse back in 1944, but when he saw it, close to the church, Bill was certain that that wasn’t it as the building that they had been held in was nearer the edge of the village as they’d climbed out through a back window & into some fields. Fortunately, on this occasion, I noticed that (unlike our previous visit) the Mairie was open, so, me being me, popped in and introduced myself & explained what we were doing. One of the people in the room was M. Denis Lenesley – the local mayor – and he immediately offered to show us the original schoolhouse. Just on this point, whenever we’ve been in France looking for information (whether with a veteran or not), the local Mayors and their staff have been wonderfully helpful in many cases stopping what they were doing to help us with our enquiries; without their assistance, we wouldn’t have found as much as we did and it is very much appreciated. When we made our way to the old schoolhouse (now a private residence) we were joined by an old gentleman who recalled the schoolhouse being used as a prison during the war when he was a youngster. 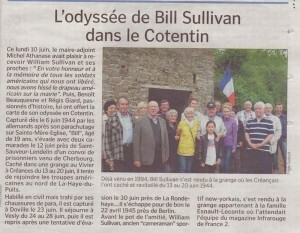 Following our visit, M. Lenesley wrote about it in the village newsletter. Our final visit of the day was to “The Monastery” at La Chapelle sur Vire. This was used as a clearing station for American prisoners of war. Unfortunately Bill didn’t recognise the place, however it was 69 years ago! Having had a walk around the grounds, we decided that it was time to head off for some food and this was where our plans went awry! Of course everything had gone so well so far something had to go wrong… everywhere was shut! So, much to my embarrassment and Bill’s annoyance, we ended up at McDonald’s!! 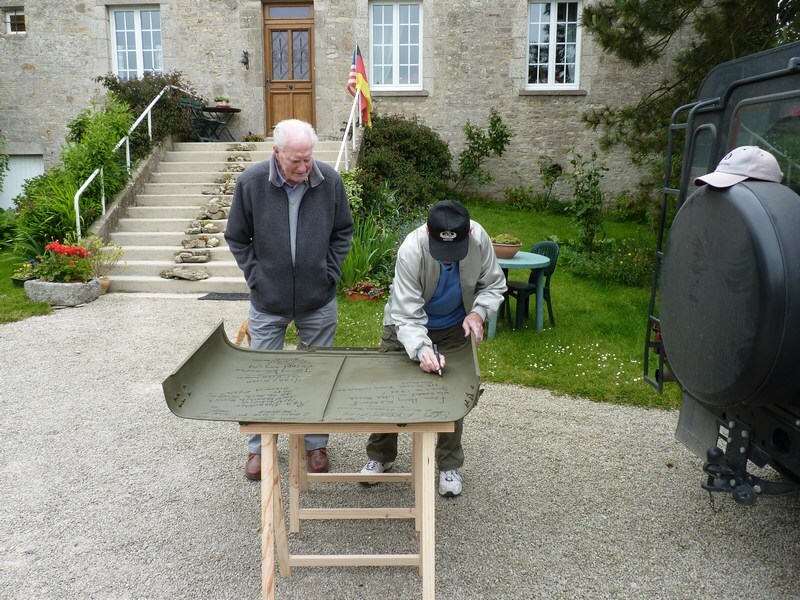 This entry was written by ColinAuthor, posted on January 3, 2014 at 8:51 pm, filed under M/Sgt Morris Sheppard, Normandy Trips and tagged 3rd Battalion Scots Guards, 82nd Airborne Division, Al Krietsch, Bill Sullivan, Creances, Doville, La Chapelle sur Vire, La Cour d'Aisy, La Fiere, La Ronde Haye, Marty Knafl, Morris Sheppard, Operation BLUECOAT, Peter Findlay, River Merderet, Sainte Mere Eglise, The Monastery, Varenguebec. Bookmark the permalink. Follow any comments here with the RSS feed for this post. Post a comment or leave a trackback: Trackback URL.